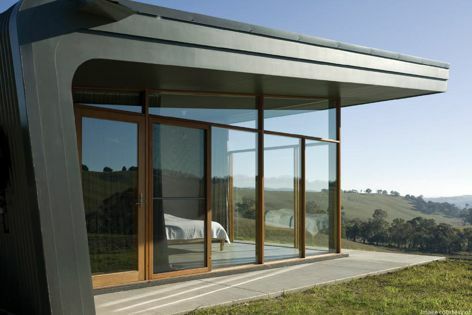 Aneeta sashless windows enable interior spaces to be connected to the outdoors, while allowing natural ventilation and reducing reliance on artificial climate control. Architect: Noxon Giffen. Photography: Richard Glover. Flomotion sashless windows incorporate a patented system that moves two panes of glass up or down simultaneously, to provide an extremely large opening. Duomode sashless windows combine the streamlined appearance of a fixed window with the functionality of a fully operable window. Don’t let anything interrupt your view. We enjoy our purest experiences when we’re totally absorbed in a moment with nothing distracting us. The concept of removing distractions and putting the minimum of materials between the viewer and the outside world lies at the heart of Aneeta Windows’ sleek and unobtrusive designs. Aneeta’s Duomode sashless window is a modern take on traditional counterbalance and bifold servery windows. It combines the streamlined appearance of a fixed window with the functionality of a fully operable window, thanks to a patented locking system that allows the large panes to be locked to operate as either a counterbalance window or a servery window. Duomode also allows the bottom pane to be restricted while still allowing the top pane to operate, so children and pets are protected. Available in two-pane or three-pane configurations, Duomode enables a connection between interior spaces and the outdoors. By releasing the locks and sliding the panes in counterbalanced or independent mode, configurations can be chosen quickly and easily. Flomotion sashless windows incorporate a patented system that moves two panes of glass up or down simultaneously, unlike traditional servery sashless windows with panes that move individually. This unique design – the way the panes move and the sashless composition – means the panes stack with one movement. The moving glass panes overlap against a single pane, providing an extremely large opening. Regardless of which Aneeta sashless window is specified, it will allow for natural ventilation. Free control of the panes means they can be slid up a touch to let fresh air in while avoiding chilly drafts or, on hotter days, opened fully to invite refreshing breezes inside, reducing reliance on artificial cooling and heating. The range is also available in double-glazed options that can help achieve a five-star energy rating.